Danimal27 Asks: Why is Poker called Poker? The card game “Poker” first was called such around the early 19th century. Despite this happening fairly recently, it isn’t directly known how Poker got its name, but there are two leading theories that more or less coalesce into one very probable origin. The first theory is that it came from the name of a French card game that resembled Poker somewhat called “Poque”. There was also a German card game that is similar to Poker called “Pochspiel”, which in turn got its name from the German word “pochen” (which is also where the French “Poque” got its name). “Pochen” at the time meant “to brag or bluff”. It should also be noted here that even after Poker got its name, it was also sometimes called “bluff”. Most Poker historians tend to lean towards the French “Poque” origin, in terms of where the game directly got its name, because Poker seems to have first popped up and spread from New Orleans in the very early 19th century. Not too surprisingly from the location, the French game of Poque was commonly played here, lending credence to the “Poque” origin. Whether that’s the case or the alternate “Pochspiel” derivation, it would seem very plausible and probable that the ultimate origin was from the German “pochen”, which meant “brag/bluff”. Bluff: First popped up in this context around the mid-19th century in American English either from “bluffen”, meaning “to brag or boast”, or “verbluffen”, meaning “to mislead”. Ante: from the Latin “ante”, meaning “before”, which in turn came from the Proto-Indo-European “*anti”, meaning “facing opposite, before, or in front of”. *Note: This article is written in cooperation with PokerListings.com; which is the world’s largest online Poker guide featuring breaking Poker news, and detailed Poker strategy articles and videos. 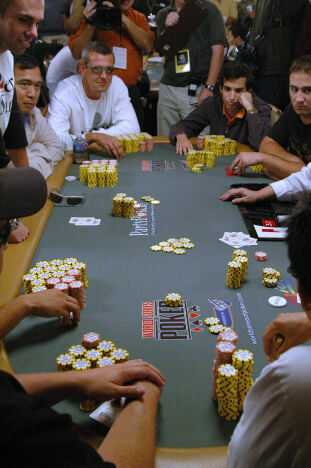 There are two main kinds of bluffing in Poker, a “pure bluff”, meaning that the only hope of winning is if all others in the game fold, then a “semi-bluff” where the cards held don’t have much hope of winning, but may improve significantly after exchanging or acquiring other cards, depending on the rules of the particular type of Poker. Up until the late 20th century, the generally accepted view of the origin of Poker was that it came from the 16th century Persian game “As Nas”, which was played with 25 cards and strongly resembled “Five Card Stud”. It also featured similar “hands” to Poker. This has changed recently with gaming historians noting that the French game “Poque” was commonly played in the regions Poker seems to have first showed up in, and the rules are somewhat similar to Poker, as is even the name. However, it should be noted that there were numerous card games with similar such rules, so the exact origin of Poker is still debated and it may well have derived from rules of multiple existing card games at the time of its inception. One somewhat unique thing about Poker, that set it apart from many other types of card games of the day and drastically bolstered its popularity, was the betting elements incorporated into the game itself. One of the earliest documented instances of Poker being played was from 1829 by English actor Joseph Crowell. He stated he played the game in New Orleans that year using a deck of 20 cards and four players, each getting five cards, with bets placed after the cards were dealt. In the early days of Poker, it was common to use fewer cards the fewer people were playing. The game is thought to have spread from New Orleans up the Mississippi on river boats where gambling was extremely popular. The ability to draw new cards in certain types of Poker games was introduced sometime before 1850. The ability to have a “wild card” was introduced around 1875. One trick as to when to bluff and when not (to optimize one’s chance of coming out ahead over many hands) is to use a randomizing agent to help you determine whether to bluff or not, such as deriving a randomizing method off of the exact time when the hand is dealt or some mental randomizer using the number of cards of a certain color in your hand or the like. When using these tricks, you should also factor in the general odds of winning the bluff, partially based on how many people are in the game and how much you have to put in vs. how much the pot is worth. In the sense of “vertical cliff, or flat front”, “bluff” originated from the Dutch “blaf”, meaning “flat, broad”, particularly referencing the flat vertical bows of ships, then later the definition was broadened to refer to certain features of landscape. At the time of the game Poker beginning to be called such, the word “poker” had already been around for about three centuries, first popping up in the early 16th century meaning “metal rod”, derived from the word “poke”. “Poke” first turned up in English around the 14th century, probably from the Middle Dutch “poken”, which just meant “to poke”, which in turn came from the Proto-Germanic root “*puk-“.